Episode 163: It’s a Trap! Join Mox and Redna of It’s a Trap! Podcast as they fill in for Jason and Heather who are both under the weather! 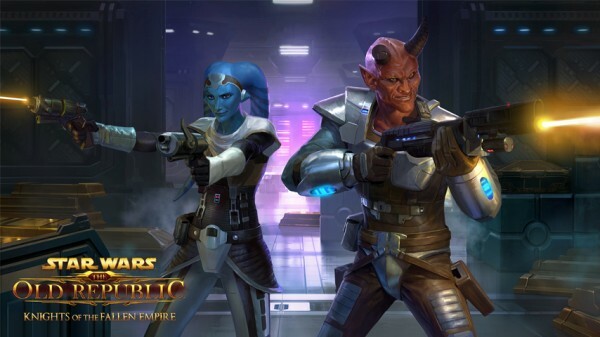 They discuss what they’ve currently been up to in-game, including Knights of the Fallen Empire Chapter 13: Profit and Plunder, and the new Eternal Championship as well as other news and issues in Star Wars: The Old Republic. The Eternal Championship is live! Dulfy has a great guide on her website. Eric Musco answered some questions about the Eternal Championship speed run cheats. Vulkk has posted the information on his website! Eternal Empire Walker Changes – The Walker which was previously only available as a drop in Star Fortress is now also available for purchase using the Eternal Championship currency. 48 Tokens. In addition, the walker is also Bound to Legacy. Eric Musco has also addressed some concerns with Weapon Tuning on the official forums. Is the Weapon Tuning more rare than other rare items? The Weapon Tuning’s drop rate is on par with most other rare items found in a pack. At times there are rare items which are exceedingly rare, such as the Unstable Lightsaber, but the Weapon Tuning is not one of them. As a note, we are looking at more clearly designating that extra rarity as Platinum in 4.5. Are Weapon Tunings only going to drop from the Cartel Market? Although we introduced the system through the Cartel Market, there are plans moving forward to have Weapon Tunings that are not a part of the Cartel Market. That being said, future packs will likely contain them as well. My favorite item doesn’t have a Weapon Tuning Slot, will you be adding more? Yup! In fact, we will be making a thread in the Suggestion Box forum where you can let us know specific weapons that you would like to see a Tuning Slot added to. Community Manager Eric Musco recently did an all-day livestream on SWTOR’s official Twitch channel on Saturday, May 14th, where he played through all of the current chapters of Knights of the Fallen Empire! Thanks Redna for filling in on this week’s episode! He is one of the hosts of the Star Wars canon podcast, It’s a Trap! and has previously been a guest on Corellian Run Radio. You can follow him on Twitter @R3DN4 and check out his podcast’s website. Sechari, a streamer previously featured on the show, has re-branded himself. He is now an all-around Star Wars gaming streamer–not exclusively Star Wars: The Old Republic! You can see more details of Sechari’s stream at iamsechari.com. Are you interested in getting your guild noticed, maybe you have an in-game event you would like us to announce or maybe you want to join us on the air, why not contact us about making a mention on our next podcast? If you are interested, send an email to corellianrun@gmail.com or heather@prettylittlesith.com. A lot is happening here at Corellian Run Radio. We are still looking for writers, assistants to help moderate live stream chat and other areas to help our podcast continue to grow. Stay tuned! Contact us through our website (corellianrun.com), Facebook page, or Facebook group. Also we are looking for writers! If anyone is interested, send an email to corellianrun@gmail.com.